Amir Khan (31-4, 19 KOs) says he’ll be ready to challenge for a world title against WBA/WBC welterweight champion Keith ‘One Time’ Thurman (28-0, 22 KOs) after he takes a tune-up fight this March. “I love the Thurman fight. After March tune up,” said Khan. Taking on Thurman in 2018 would not be a very smart move on Khan’s part. That’s a fight that Khan needs to take after he has 3 or 4 tune-up level bouts under his belt. Khan has been out of boxing for too long for him to fight Thurman in his second fight back in 2018. Thurman always has fights planned in 2018, so there’s no opportunity for Khan to fight him next year. Thurman will be fighting Jessie Vargas on April 16. After that, Thurman will face Shawn Porter in a rematch that nobody wants to see. Then if Thurman isn’t injured by that point, he’ll face Danny Garcia in a rematch. I’m predicting that Thurman will be injured after the Vargas fight and will spend the rest of 2018 on the shelf, licking his wounds. Thurman now known as ‘One Time’ a year to some boxing fans. Khan is going to fight a very easy opponent for his March fight. You fault Khan for taking a soft touch. He hasn’t fought since May of 2016 in losing to Saul Canelo Alvarez by a 6th round knockout. Khan had intended on getting back into the ring a lot earlier in 2017, but one thing led to another and he just never got back into it. Khan did make a couple of comments about potential fights in 2017, but the fights failed to materialize. Khan is now 31-years-old, and he’ll have been out of the ring for almost 2 years when he does resume his career in March. 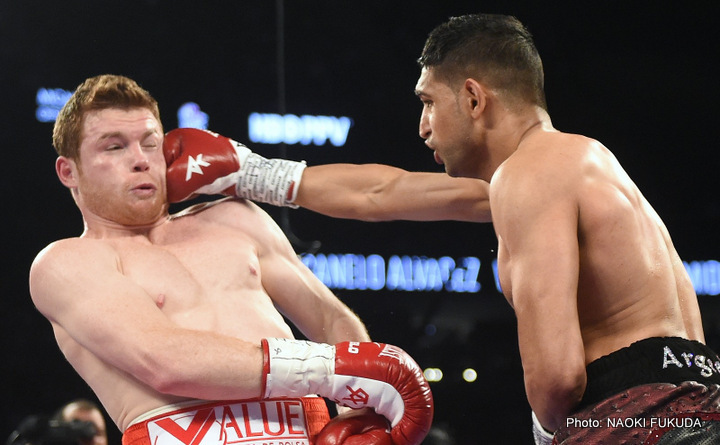 It’ll be exactly 22 months since Khan was knocked unconscious by former WBC middleweight champion Canelo Alvarez on May 7, 2016. ”Would love that at 147,” said Khan when asked if he’d be interested in fighting Broner. Khan vs. Broner would be a good fight. Broner, 28, would be the ideal opponent for Khan to fight, either in March or his second fight in 2018. It’s clear at this point that Broner’s career is on the downside, and he’s now pretty much just fighting whoever his management can scrape up for him. In Broner’s last fight, he was beaten by Mikey Garcia by a one-sided 12 round unanimous decision on July 29. That was Broner’s second fight of the year. He’d looked poor last February in beating Adrian Granados by a questionable 10 round split decision. Khan and Broner are in the same situation right now with neither of them going anywhere in the 147-lb. division other than maybe getting lucky in being given another undeserving title shot. Khan and Broner might as well face each other, because it would be a good fight. Khan will have a better chance of beating Broner than he will if he faces Kell Brook.